How to finally increase club head speed by generating more power through the backstroke, downstroke and moment of impact. Nothing is more enjoyable than hitting a nice, long drive. It’s one of the reasons we play the game of golf. That’s why it can be incredibly frustrating when you’re swinging out of your shoes and the ball isn’t going anywhere off the tee. You bought the latest driver. You’re packing every swing with all the power you’ve got. And your buddies are still swinging it by you while you’re laid up on that par 5. I am going to share three key tips that will get you out of this rut and on to the green in fewer strokes. 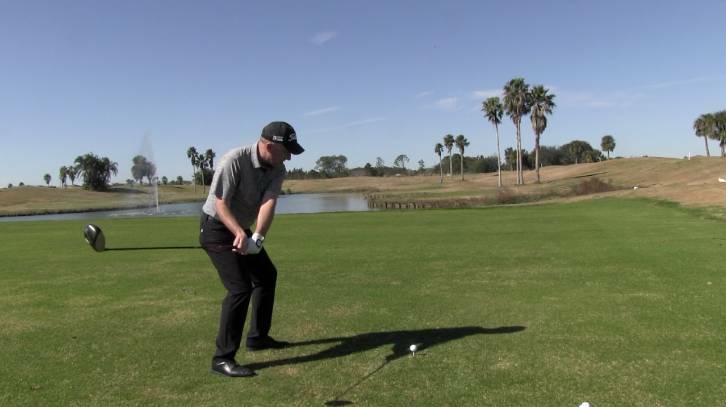 All these tips help you increase club head speed by accomplishing one essential goal: using the ground to generate maximum power. Then, I’ll provide you with a drill that provides a practical strategy for making these concepts a natural part of your swing. Some of these tips to increase distance may go against advice you’ve already been given. As a PGA golf instructor, I can assure you, when my students put these key ideas to work, they start killing it. They increase club head speed, and they start driving the golf ball farther than they ever have before. Odds are pretty good that you’ve been advised to keep your trail leg really bent on your swing. I strongly encourage you to do the opposite. As you swing back, you actually want to release that trail leg. Feel yourself turning into your trail hip so your leg pulls itself straight. You’ll know you’re releasing correctly if you feel pressure in your trail glute. And if you’ve been following my videos and articles on USGolfTV, you know by now what pressure means. When you release the back leg, you are essentially loading your swing. You create pressure in your trail glute and you transfer pressure down into that trail heel, setting yourself up to generate power from the ground. And that power can help increase club head speed. Be sure you feel that pressure in your heel. It’s vital for this next tip. The transition is where the magic happens, and is probably the most important place to increase club head speed. Of course, you already know this instinctively. Every golfer uses this moment to pack as much power as possible into their swing. 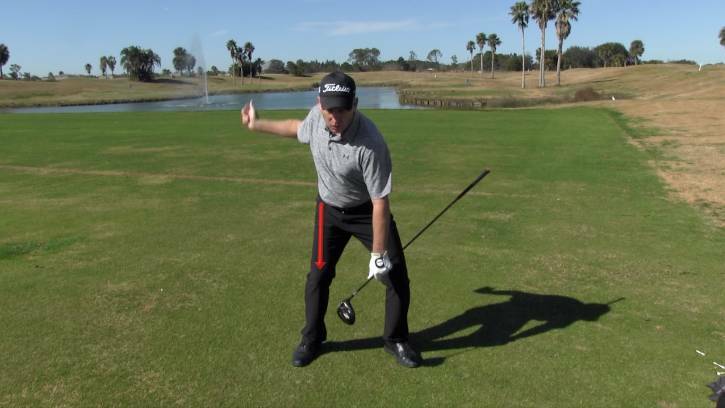 Unfortunately, most golfers are not approaching their downstroke in the most effective way. As a result, you probably are struggling to increase club head speed, and sacrificing distance. 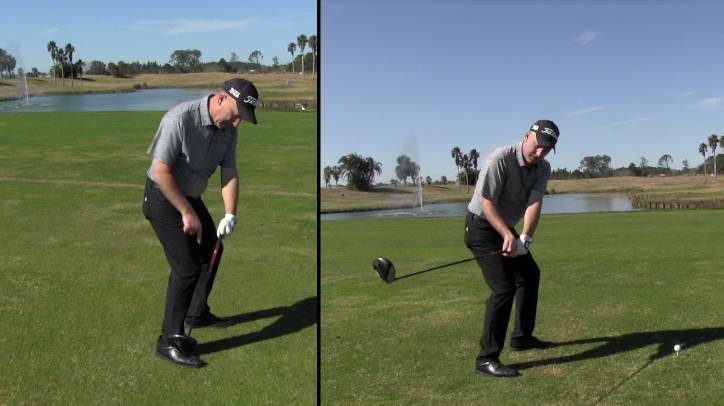 If you’re like a lot of golfers, you’re probably in the habit of moving your hips laterally, toward the target on your downstroke. Many people try to create power and increase club head speed by making this hard movement toward the target. I can admit that this is a valid technique. However, it’s not the most effective technique. What you really want to do on the downswing is squat slightly. You should feel the pressure in your trail foot work from the heel to the middle of the foot. In doing this, you’re really loading into the ground, setting yourself up to push off of that trail foot. If you’ve been shifting your hips toward the target, you’ve been pushing off of your lead foot. Again, this isn’t wrong, it’s just not your most effective option. And while we’re on the topic of breaking rules you’ve been taught . . . 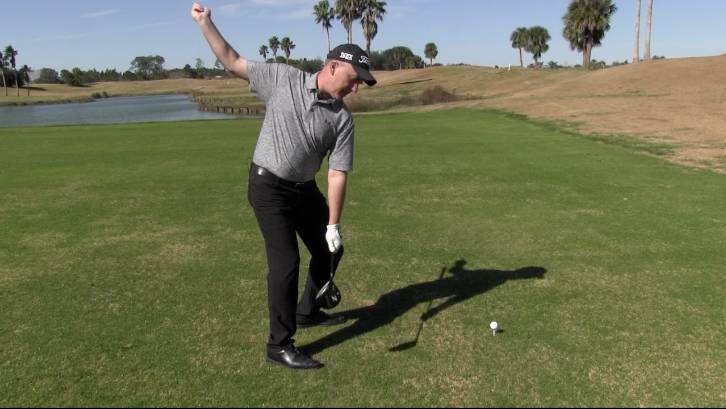 This third tip to increase club head speed might surprise you, but bear with me. As you come into the moment of impact, you want to feel the handle of your golf club pull up and back towards your body. If you pay close attention to the longest drivers on both the men’s and women’s tours, you’ll notice that they do exactly this. When you pull that handle up and back, you kick speed out into the clubhead. The motion creates a whip-like effect. Imagine you’re towing your kids on a tube tied to a speedboat. When they yell at you to go faster, you make a sharp turn, and the sudden shift in direction kicks speed out into tube. It’s the same idea when you pull the handle of your golf club up and back at impact. 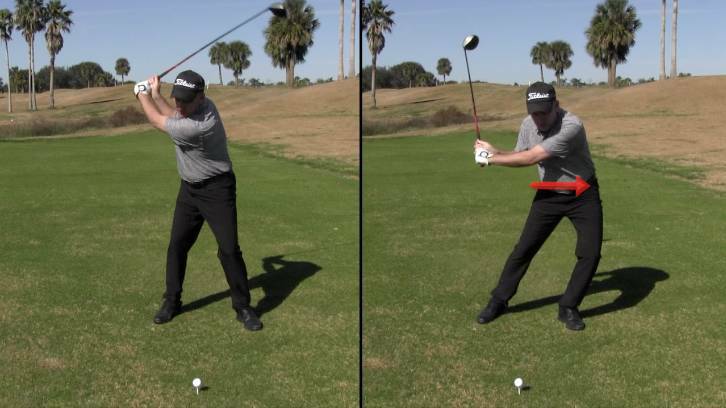 This transfer, when done properly, will increase club head speed. Okay, so that was a lot of information. And these are, admittedly, not easy adjustments to make. Don’t worry. I’m going to share a drill that will help you turn these intricate details into a natural part of your swing. 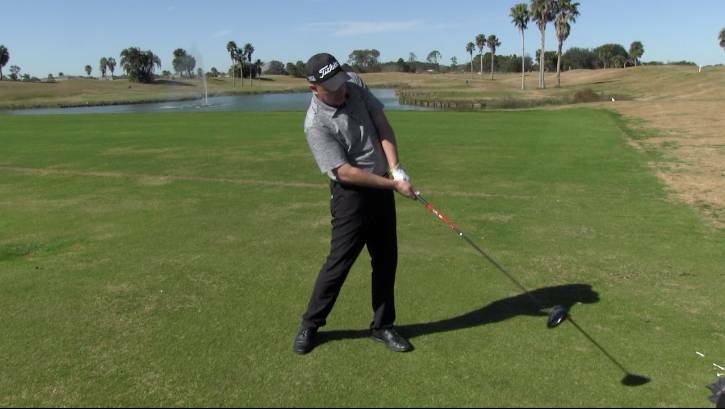 I use this drill with all of my students, from teenagers to touring professionals. It’s a simple way to get this new technique into your body. Tee up and take your regular setup. 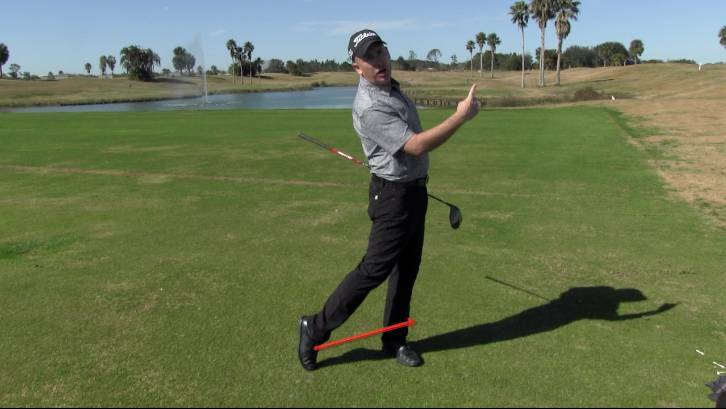 Draw the club back so your lead arm is parallel to the ground. Squat a little, feeling the pressure in your trail glute and trail foot. Push up off of your trail foot. Extend your body through impact. Don’t worry about hitting a 300-yard drive when you start this drill. You may only get around 100 yards at first. Your initial goal is to master the technique. I guarantee you, after you’ve performed this drill several times, you’ll really start to pop it. You drive the ball farther when you increase club head speed. You increase club head speed when you generate maximum power. And the most effective way to generate power is to use the ground instead of your arms and upper body. Load your golf swing on the backstroke by releasing your trail leg, transferring pressure into your trail glute and heel. Squat slightly into the downstroke, feeling pressure work from the heel to the middle of your trail foot. Then push up and off the trail foot. At the moment of impact, pull the handle of your golf club up and back. Use the drill above to turn these tips into habits. Some of these ideas may feel counter-intuitive. Some of them may contradict advice you’ve already been given. But I guarantee you, if you follow these tips, you will finally start to get some real distance off the tee. Has this advice been helpful? Is there anything here that doesn’t make sense to you? Do you have a different technique to increase club head speed? Join the conversation in the comments. Whether you agree or disagree, have questions or criticisms, we always look forward to discussing golf with you. If you’re looking for the best golf drivers for 2018, check out this great resource from our friends at Golfers Authority!